On a recent trip through Iowa I stopped at the Polk City Cemetery, where early Latter-day Saint leader John C. Bennett is buried. Two weeks later (February 1, 1841) John C. Bennett became the mayor of Nauvoo. On April 8th he became the “Assistant President” of the LDS Church, taking over the office for Sidney Rigdon, who was ill, until such a time as Rigdon could resume his responsibilities. When Joseph confronted Bennett with this allegation, Bennett confessed it was true. Nevertheless, he continued in favor with the Prophet and in leadership in the Church for another year, though this season was not without controversy. Rumors of seducing women under the guise of “spiritual wifery” dogged Bennett. He was believed to offer medical services as an abortionist to LDS women with unwanted pregnancies. He seemed to view plural marriage as something to be engaged in for his own gratification rather than as a holy calling. Yet he was allowed to continue as a “faithful” Latter-day Saint until, according to biographer Fawn Brodie, Bennett and the Prophet set their affections on the same young woman (19-year-old Nancy Rigdon). Bennett was formally excommunicated from the LDS Church on June 23, 1842. He became a bitter enemy of Joseph and the Saints, publishing exposes of scandalous Mormon behavior in Nauvoo. 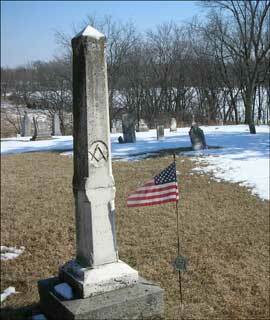 I was surprised, then, to find John C. Bennett buried in Polk City, Iowa. His grave is situated in a beautiful spot atop a hill overlooking a tranquil lake. His tombstone is one of the largest in the cemetery. A flag honoring his service as a surgeon in the Union army sits beside his grave. It is reported that he was well respected by his Polk City neighbors and was “well-off” when he died. He was known in Iowa for practicing medicine, breeding chickens and cattle, and promoting anti-slavery issues. It is believed that John C. Bennett suffered a stroke and its aftermath. He lingered with a protracted illness until his death in 1867 at the age of 64. His second wife, Sarah, died about a year later and is buried beside him. 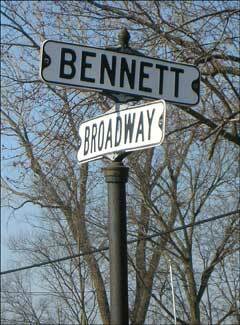 Bennett’s reputation as a Mormon was deplorable; but in Polk City, Iowa, they named a street after him. This entry was posted in Early Mormonism and tagged John C. Bennett. Bookmark the permalink. I was so intrigued by the posting that I had to look this guy up and read more about him. What a character! There is a certain audacity, pompousity, snake oil salesman type, and religious entrepeneurism that runs through these early Mormon leaders. Nauvoo must have had the first Burger King franchise because of all of the Whoppers peddled in that place. Looks like John C. Bennitt was able to give Joseph Smith and Brother Young a run for their money. One flim flam man to another. I love these prophesies. These guys were really creative, but not real accurate. I noticed that there is a Masonic symbol on the gravestone. What’s that about….I wonder? Please understand that although I am not a christian – I find this site and the ongoing discussion between the LDS/Non LDS communitees to be very curious – no doubt the reason that the LDS “historians” presented a negative impression of John C Bennett was due to the fact that he was seen as a traitorous figure to their faith. John C. Bennett was a womanizer, engaged in spiritual wifery, for the purpose of gratifying his sexual passions. He become a bitter enemy of the truth and God’s church. Mormons look upon his life with sadness and wanting. Oh, that he could have been more faithful and more controlling. I do not hate the man, but he sure would hate me if he were alive today. If a faithful believer forcast that Mr X would die in the street – unloved and poor- it’s still emotionally easier for other believers to accept that version, even if Mr X actually lived a long and happy life as a beet farmer in Oregon. No surprise there – that sort of thinking works both ways. True, Mr Bennett was no “Champion of Morality” it seems he slept about and may well have lied and cheated. Josheph Smith was also said to have practiced folk magic,and to “conjure” to look for buried treasure. Such is life. It really seems a story of power struggle and intrigue. Someone should write novel based on the characters and story line. How old was Bennett when he was working with Smith, and did he join another church after being excommunicated from the Saints? Was he active in that church? I’m simply curious – does anyone here know?